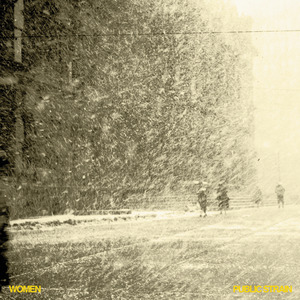 On their self-titled debut, Women embraced sonic brashness that deeper examination revealed to be tinted with sly pop melody. 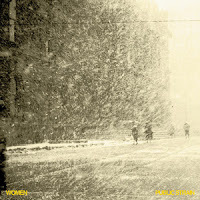 With Public Strain the band have honed a sound truthful to that reverb drenched noise while allowing the pop sensibilities to surface into clearer focus. In the autumn of 2009, Patrick Flegel (vocals/guitar), Matt Flegel (bass/vocals), Chris Reimer (guitar/vocals), and Michael Wallace (drums) went into the studio with an abundance of ideas, working around conflicting schedules and graveyard shifts. With Chad VanGaalen again on production duties, the band laboriously crafted a timeless sounding recording over the dead of winter in Alberta, Canada. The result exploits their usage of harsh, grating dissonance in smaller and controlled doses, using noise as the foundation for richly structured, layered songwriting. From the opening strains of "Can't You See" it's clear that the album is far more than just a continuation of their debut. Resting upon Matt Flegel's plodding bass line, Patrick Flegel's deadpan vocal delivery, and Chris Reimer on bowed guitars and cello, this moody, nocturnal ballad opens the album on a dark note – one that is quickly countered by "Heat Distraction", a jigsaw of bright guitar phrases and winding time signatures. This exact balance of delicate and dense is a pervasive thread throughout the album, reflecting the contradiction of the band's environment buried in urban sprawl framed by prairie landscape. Whether twisting through the urgent Krautrock of "Locust Valley", an exercise of harmony through simplicity, or climaxing with the bittersweet melody of "Eyesore", the album somehow builds luminous contrast out of a palette of greys. In places claustrophobic, conjuring walking dreams of sexual anguish and general decay, elsewhere soaring with vintage guitar tones and vocal melodies or collapsing into swirling, mesmerizing swells, Public Strain cycles through insomnia, paranoia, resignation and euphoria, to capture a band with an undeniable voice coming into full awareness of their craft.